The pacemaker is an electronic biomedical device that can regulate the human heartbeat when its natural regulating mechanisms break down. It is a small box surgically implanted in the chest cavity and has electrodes that are in direct contact with the heart. First developed in the 1950s, the pacemaker has undergone various design changes and has found new applications since its invention. Today, pacemakers are widely used, implanted in tens of thousands of patients annually. The heart is composed of four chambers, which make up two pumps. The right pump receives the blood returning from the body and pumps it to the lungs. The left pump gets blood from the lungs and pumps it out to the rest of the body. Each pump is made up of two chambers, an atrium and a ventricle. The atrium collects the incoming blood. When it contracts, it transfers the blood to the ventricle. When the ventricle contracts, the blood is pumped away from the heart. In a normal functioning heart, the pumping action is synchronized by the pacemaker region of the heart, or sinoatrial node, which is located in the right atrium. This is a natural pacemaker that has the ability to create electrical energy. The electrical impulse is created by the diffusion of calcium ions, sodium ions, and potassium ions across the membrane of cells in the pacemaker region. The impulse created by the motion of these ions is first transferred to the atria, causing them to contract and push blood into the ventricles. After about 150 milliseconds, the impulse moves to the ventricles, causing them to contract and pump blood away from the heart. As the impulse moves away from each chamber of the heart, that section relaxes. Unfortunately, the natural pacemaker can malfunction, leading to abnormal heartbeats. These arrhythmias can be very serious, causing blackouts, heart attacks, and even death. Electronic pacemakers are designed to supplement the heart's own natural controls and to regulate the beating heart when these break down. It is able to do this because it is equipped with sensors that constantly monitor the patient's heart, and a battery that sends electricity, when needed, through lead wires to the heart itself to stimulate the heart to beat. In addition to outer units, artificial pacemakers can be permanently implanted in a patient's chest. This is done by first guiding the lead through a vein and into a chamber of the heart, where the lead is secured. Fluoroscopic imaging helps facilitate this process. 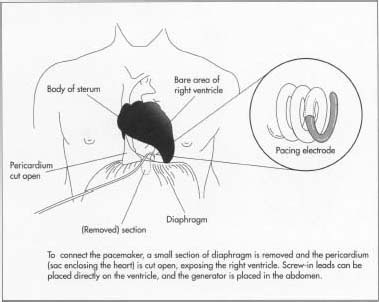 The pacemaker itself is next placed in a pocket, which is formed by surgery just above the upper abdominal quadrant. The lead wire is then connected to the pacemaker, and the pocket is sewn shut. This is a vast improvement over early methods, which required opening the chest cavity and attaching the leads directly to the outer surface of the heart. The idea of using an electronic device to provide consistent regulation of the beating heart was not initially obvious to the early developers of the pacemaker. The first pacemaker, developed by Paul Zoll in 1952, was a portable version of a cardiac resuscitator. It had two lead wires that could be attached to a belt worn by the patient. It was plugged into the nearest wall socket and delivered an electric shock that stimulated the heart of a patient having an attack. This stimulation would usually be enough to cause the heart to resume its normal function. While moderately effective, this early pacemaker was primarily used in emergency situations. Through 1957 and 1960 significant improvements were made to Zoll's original invention. In an attempt to reduce the amount of voltage needed to restart the heart and increase the length of time electronic pacing could be accomplished, C. Walton Lillehei made a pacemaker that had leads attached directly to the outer wall of the heart. Later, in 1958, a battery was added as the power source, making the pacemaker truly portable, which allowed patients to be mobile. This also enabled patients to use the pacemaker continuously instead of only for emergencies. Lillehei's pacemaker was external. William Chardack and Wilson Greatbatch invented the first implantable pacemaker. It was implanted in a living patient in 1960. The modern technique for putting a pacemaker into a patient's heart was developed by Seymour Furman. Instead of cutting open the chest cavity, he used a method of inserting the leads into a vein and threading them up into the ventricles. With the leads inside the heart, even lower voltages were needed to regulate the heartbeat. This increased the length of time a pacemaker could be inside a person. Although his method was not widely used initially, by the late 1960s most cardiac specialists had switched to Furman's endocardial pacemakers. Since then improvements have been made in their design, including smaller pacemaker devices, longer lasting batteries, and computer controls. The materials used to construct pacemakers must be pharnacologically inert, nontoxic, sterilizable, and able to function in the environmental conditions of the body. The various parts of the pacemaker, including the casing, microelectronics, and the leads, are all made with biocompatible materials. Typically, the casing is made of titanium or a titanium alloy. The lead is also made of a metal alloy, but it is insulated by a polymer such as polyurethane. Only the metal tip of the lead is exposed. The circuitry is usually made of modified silicon semiconductors. Many types of pacemakers are available. The North American Society of Pacing and Electrophysiology (NASPE) has classified them by which heart chamber is paced, which chamber is sensed, how the pacemaker responds to a sensed beat, and whether it is programmable. Despite this vast array of models, all pacemakers are essentially composed of a battery, lead wires, and circuitry. The primary function of a pacemaker battery is to store enough energy to stimulate the heart with a jolt of electricity. Additionally, it also provides power to the sensors and timing devices. Since these batteries are implanted into the body, they are designed to meet specific characteristics. First, they must be able to generate about five volts of power, a level that is slightly higher than the amount required to stimulate the heart. Second, they must retain their power over many years. A minimum time frame is four years. Third, they must have a predictable life cycle, allowing the doctor to know when a replacement is required. Finally, they must be able to function when hermetically (airtight) sealed. Batteries have two metals that form the anode and cathode. These are the battery components through which charge is transferred. Some examples include lithium/iodide, cadmium/nickel oxide, and nuclear batteries. 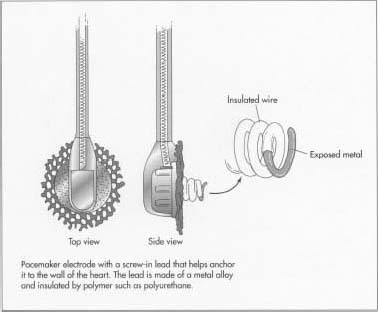 Pacemaker leads are thin, insulated wires that are designed to carry electricity between the battery and the heart. Depending on the type of pacemaker, it will contain either a single lead, for single chamber pacemakers, or two leads, for dual chamber pacemakers. With the constant beating of the heart, these wires are chronically flexed and must be resistant to fracture. There are many styles of leads available, with primary design differences found at the exposed end. Many of the leads have a screw-in tip, which helps anchor them to the inner wall of the heart. and externally programmable controls. The circuitry is composed primarily of resistors, capacitors, diodes, and semiconductors. Modern pacemaker circuitry is a vast improvement over earlier models. With the application of semiconductors, circuit boards have become much smaller. They also require less energy, produce less heat, and are highly reliable. Pacemakers are sophisticated electronic devices. Therefore, some manufacturers rely on outside suppliers to provide many of the component parts. The construction of a pacemaker is not a linear process but an integrated one. Component parts such as the battery, leads, and the circuitry are constructed individually, then pieced together to form the final product. 1 The primary type of battery used in pacemakers is a lithium/iodine cell. One method used by manufacturers to make these batteries involves first mixing together the iodine and a polymer such as poly2-vinylpyridine (PVP). They are heated together, forming a molten charge-transfer complex. This liquid is then poured into a half moon-shaped, preformed cell which contains the other components of the battery, including the lithium anode (positive charge) and a cathode collector screen. The iodine/polymer blend solidifies as it cools to form the cathode. After the cathode is formed, the battery is hermetically sealed to prevent moisture from entering. 2 The leads are typically composed of a metal alloy. The wire is made by an extrusion process in which the metal is heated until it is molten, then pushed through an appropriately sized opening. It is cut, then bundled with many other wires and treated with a polymeric insulator such as polyurethane. One end of the lead wires is fashioned with a shaped tip, and the other is fitted with a pacemaker connector. the semiconductor chips, resistors, capacitors, and other devices. Using a complex method known as hybridization, these components are combined to form a single complex circuit. Construction begins with a small board (less than 0.32 sq in [2 sq cm]) which has the electronic configuration mapped out. The appropriate components are put in place on the board. They are then affixed using a minimum number of soldering welds. 4 When all of the component pieces are available, final assembly takes place. The circuitry is connected to the battery, and both are inserted into the metal casing. The casing used for a pacemaker is typically formed using titanium or a titanium alloy. It is constructed in multiple pieces that are sealed together after the other pacemaker components are introduced. A fitting is also affixed to the casing, providing a connecting point for the leads. 5 The finished devices are then put into final packaging along with accessories. After being exhaustively tested, they are then sent out to distributors and finally to doctors. The quality of each pacemaker is ensured by making visual and electrical inspections throughout the entire production process. These tests will detect most flaws. Since the batteries must be absolutely reliable, they are specially manufactured and exhaustively tested, thereby increasing the associated costs tremendously. The functionality of each finished pacemaker is also tested before it is sent out for sale. Many of these tests are done under varying environmental conditions, such as excessive humidity and stress. Manufacturers set their own quality standards for the pacemakers that they produce. However, standards and performance recommendations are required by various medical organizations and governmental agencies. In the United States, pacemakers are classified as Class III biomedical devices, which means they require pre-market approval from the United States Food and Drug Administration (FDA). With the increasing numbers of senior citizens in the United States, it is anticipated that a greater percentage of the population will require pacemakers. As research efforts continue, future devices promise to be longer lasting, more reliable, and more versatile. Advances in battery technology, such as using radioactive isotopes for power, will undoubtedly improve the longevity of implanted pacemakers. Developments in microelectronics should provide even smaller devices which are less prone to environmental interferences. A late-breaking development in the field is the application of cardiac pacemaking technology to the brain. In this system, scientists connect the lead wires to a specific site on the brain and stimulate it as needed to regulate heartbeat. This device has been shown to be particularly effective in calming the tremors associated with Parkinson's disease. Banbury, Catherine. Surviving Technological Innovation in the Pacemaker Industry, 1959-1990. Garland Pub., 1997. Ellenbogen, Kenneth, ed. Clinical Cardiac Pacing. Saunders, 1995. Fox, Stuart. Human Physiology. WCB Publishers, 1990. Moses, H., J. Schneider, B. Miller, and G. Taylor. A Practical Guide to Cardiac Pacing. Little, Brown and Co., 1991. Jeffrey, Kirk. "Many Paths to the Pacemaker." Invention & Technology, Spring 1997, pp. 28-39. When people refer to a pacemaker, they are actually discussing a pacing system: a pacemaker, a pacing lead, and programmer. Two parts are placed inside the body. The pacemaker is a small battery-powered device containing a tiny computer. It is designed to constantly watch your natural heart rate. When needed, it can deliver its own electrical signals to help the heart beat faster or more efficiently. These signals are much like those of a normal heart. A pacing lead is an insulated wire that carries the tiny electrical pulse to the heart so a heartbeat can begin. One end of each lead connects to the pulse generator. The other end is placed directly in a heart chamber or on the outer surface of the heart. The third part, the Programmer, is kept in a hospital or clinic. A nurse or doctor uses this specialized computer to see how the pacemaker is working and if necessary, to adjust the settings of a pacemaker. Where are the device implanted? A doctor implants each type of device in much the same way. The device itself is typically implanted just under the skin near the shoulder. Cardiac devices send electrical energy to the heart through thin, specially coated wires called leads. Leads are positioned inside or on the surface of the heart. A pacemaker system can monitor and treat your heart rhythm by delivering electrical energy to pace your heart when it senses a slow rhythm. But it is not for everyone, including patients with certain steroid allergies. Patients who have additional medical conditions that may not allow the pacemaker to function appropriately should not receive a device. Procedure risks include infection, tissue damage and kidney failure. In some cases, the device may not respond to your heart rhythm. In rare cases severe complications or device failures can occur. Electrical or magnetic fields can affect the device. Only your doctor knows what is right for you. This device is available by prescription only. Individual results may vary.